See the Orange County Real Estate Buyer Credit Flyer below for clients that purchase homes with Madison Realty. Buyer must be registered at MadisonRealtyHomes.com 30 days prior to closing in order to be eligible for the Buyer Credit. Restrictions may apply with VA or FHA loans. Buyer Refund may not be used as part of your down payment. Buyer Refund may not be used to meet the capital reserve requirements for your loan program. Subject to lender and seller/bank approval. Must be represented by Madison Realty when you purchase your home and applies to the buyer side commission. 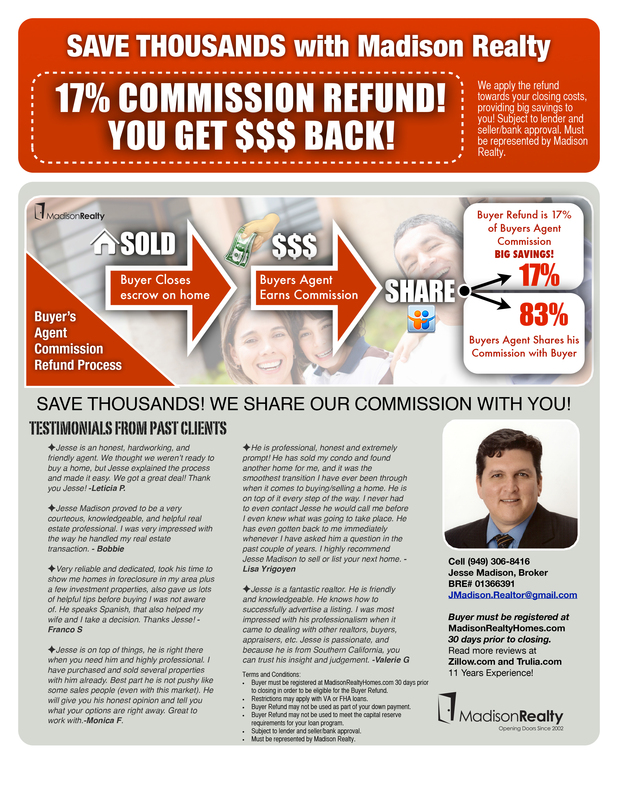 Pingback: Save Thousands- Buyer Refund Program | OC Specialist RE AgentJesse Knows OC Homes!